Absolutely amazing, definitely worth the money, lots of space, delivery was within the timeframe given. Easy to see products on the website, easy to order and delivered even to Australia on time. Awesome looking product. Good depth for notes, love the anti scam detail. This item was a present and the recipient loved the colour and thinks all his friends will want one too. 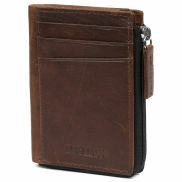 Carry your cash, cards and other essentials in style with our great selection of high quality wallets and cardholders. We have something for everyone, from slim leather cardholders to fullsize wallets in a variety of designs and colours. 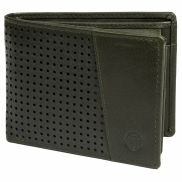 In this category you can find all of our cardholders and wallets for men. 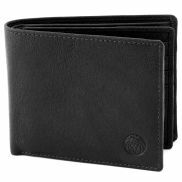 The leather wallet is the classic men's wallet for carrying banknotes, credit cards, ID cards and coins. We also have cardholders that are smaller but still quite practical on their own. Cardholders are ideal totes for business or credit cards and come in varying capacities. Wallets are obviously capable of carrying much more so we have various sizes colour schemes and designs to ensure that you can find the one that is right for you. Leather can expand a bit and so each card slot can accommodate more than one card. Just be aware that over stuffing will surely lead to looseness that may not hold just one card any further. At Trendhim, the vast majority of wallets are made of 100% cowhide leather. We use top grain leather for most models because of the real leather look and feel provided by this high quality. Full grain leather wallets age incredibly well, they also get softer and darker with use. A few models we carry are made from split leather that does not have the look and feel of top grain leather, but it is still cowhide thus wears well. A cardholder is a small practical tote that measures about 10x6cm so they are compact enough to fit into a shirt pocket. We carry both classic leather and fancy steel models. Leather cardholders have larger capacity because of the material's natural flexibility. Steel cardholders certainly protect the cards better but are usually limited to 5 or 6 cards.